But what if it isn't? What if it gets lost in the shuffle of life, jobs, kids, and bills? This book is to help you. I have intentionally kept the readings short and manageable. The purpose of this book isn't so much the readings as it is the actions. * 31 daily readings, with a bonus "What now?" reading at the end. 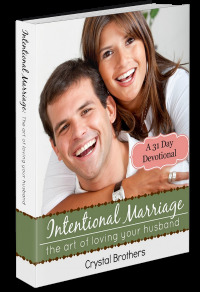 But, this book isn't just about your marriage. Because when we are searching God's will for our marriage, and living out His love in our marriage, it affects every aspect of our lives. I have prayed over this book and readers as I was writing and I pray that you will be blessed by it!